Diamonds were in demand at Bonhams New York with buyers bidding for a selection of jewellery in its September Fine Jewelry sale. Held on Friday September 21, among the top performing lots were two impressive diamond fringe necklaces weighing a total of 152.50-carats along with a 23.13-emerald-cut diamond ring - all signed by Harry Winston. These belonged to the Olympic gold medalist Katherine Domyan. The first of her diamond necklaces, with a total diamond weight of 86.30-carats, sold for $ 492,500. The second, with a total diamond weight of 66.20-carats, sold for $ 324,500. Another two Harry Winston lots belonging to Katherine Domyan which caught the eye of buyers were A 23.13-carats Emerald-Cut Diamond Ring, this sold for $ 444,5000 against its pre-sale estimate of $ 250,000 – 350,000, and A Pair of Diamond Earrings which sold for $ 187,500. A Diamond Necklace by Oscar Heyman was another diamond lot which sparkled during the sale. This necklace, a rare example of one of the jeweler’s creations from 1968, is designed as a graduated cluster set with marquise, pear and round brilliant-cut diamonds. It sold for $ 90,000. 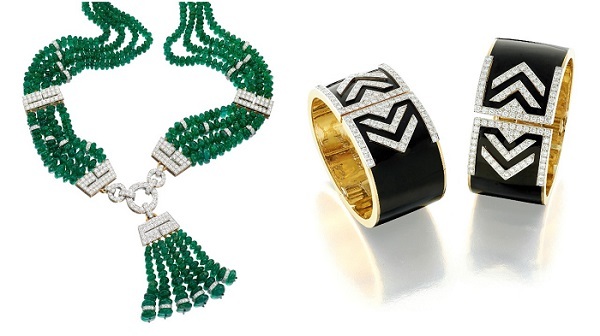 Best in class Art Deco jewellery always sells well at Bonhams Fine Jewelry sales in London, New York and Hong Kong and this sale had a number of exceptional pieces which resulted in excellent hammer prices. One of the sale’s highest value performers was A Ruby and Diamond Bracelet by Van Cleef & Arpels. Dating from the late Deco period, the bracelet set with three rectangular shaped emerald-cut Burmese rubies and flanked by half-moon shaped diamonds. Following bidding on the telephones, online and in the salesroom, it eventually went under the hammer for $ 504,500. Another Art Deco lot also captured buyers’ attention and created a bidding frenzy. Dated circa 1925, the Emerald and Diamond Bracelet by Tiffany & Co eventually sold for $187,500. The bracelet features a cushion-shaped cabochon Colombian emerald, weighing approximately 8.30-carats, flanked by similarly cut Colombian emeralds, weighing approximately 7.50 and 6.90 carats. Katherine Domyan’s much loved David Webb jewellery was very much in demand from collectors during the three-hour sale. Top performing lots included A Rock Crystal, Diamond and Ruby Bangle which sold for $ 70,000, An Emerald and Diamond Necklace which went under the hammer for $ 75,000 and A Pair of Enamel and Diamond Cuffs which eventually sold for $ 56,250, exceeding their pre-sale estimate of $ 30,000 – 40,000. - A Pair of Colombian Emerald and Diamond Pendant Earrings, signed Bulgari, set with two cushion-shaped brilliant-cut emeralds drops, weighing 10.27 and 9.11-carats respectively, sold for $ 237,500. - A Diamond and Emerald ring set with a 4.92-carats emerald-cut diamond and a rectangular-shaped Colombian emerald, weighing 3.10-carats, sold for $ 137,500, exceeding its pre-sale estimate of US$ 80,000 - 100,000. The next Bonhams Fine Jewelry sales takes place in London on Wednesday September 26, in Hong Kong on November 25 and in New York on December 4. Jewellery sales will take place in Knightsbridge, London, on October 17, November 21 and December 12, and in LA on November 19 and December 17.